Because we know that not every minute of the Big Adventure will be spent sightseeing or traveling from place to place, Brett and I are taking along three of our favorite diversions, Scrabble, Yahtzee and cards, for when we have some “down time. They’ve all made countless moves with us over the years, and we thought they deserved to be part of this journey as well. We’ve had our Scrabble set since before we were married, but have ditched the box for this trip. Brett is a skilled player and I rarely can beat him, but am always willing to embarrass myself yet again and try. We’ve had our Yahtzee cup since our son was in elementary school, and repeated coverings of duct tape have kept it functional. Our family came up with our own version of Yahtzee a long time ago, playing across the scorecard versus down each row. The game moves a little faster this way, and requires a bit more strategy, but we can’t imagine playing any other way now. Our favorite card game is a simple one: eleven card gin. We keep score, and first person to get to 500 loses. We were going to buy a couple of new decks of Bicycle playing cards to take along (versus YaYu’s deck of Studio Ghibli cards pictured above), but after I took the picture she presented us the lovely boxed set from the Metropolitan Museum of Art, something her aunt gave her years ago and that have never been used. Brett and I also enjoy putting together jigsaw puzzles, the more complicated the better, but for obvious reasons will not be putting one of those into our suitcases. We hope to buy one now and again though when we’re settled in someplace for a while, and will leave it behind for the next guests when we move on. Previous Post Kung Hei Fat Choi! Welcome the Year of the Dog! The Senior Nomads, who we’ve been following for several years, often do puzzles together, and we thought it was a very good idea! We love to do puzzles as long as there’s room for them, the more complicated the better. We always take our GREED dice. We can get large groups of people cheering and playing in almost any lobby. We love to play it with young and old. Loads of laughing for two introverts on the road. Otherwise our travel games look much like yours. Can you download books to a kindle as you travel? Now that we are hooked on public library downloads, I am not sure what we would do without them! Hmmmm – we’ll have to give some thought to GREED. It sounds like it’s right up our alley, and easy to teach to others as well. My son and I love to play Yahtzee – we’ve been having an ongoing “tournament” since he was 10 years old (and he usually wins) and have names for various combinations, songs that must be sung after certain rolls, etc. It’s crazy, but we still play whenever we get together. 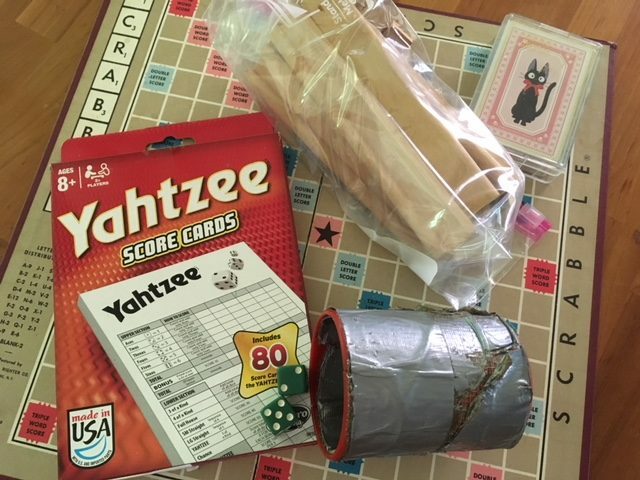 Brett and I got our grandson a National Park yahtzee set when we were at the Grand Canyon, and he’s old enough to play that now, so I’m looking forward to setting up our own tournament. We both have Kindles, and primarily use library downloads, but each of us is taking along a back-up of five books that we’ve bought, just in case we get somewhere where we can’t download something, or something we want to read isn’t available. We love our Kindles! Love both Yahtzee & Scrabble – great choices! Have you ever tried playing Yahtzee across the scorecard versus down the rows? At first it seems very easy, but gets more difficult to find rolls that fit as you get closer to the right side, so lots of strategy is required up front to determine where to place particular rolls, etc. The game goes faster played this way too. Brett is killer at Scrabble. I almost never win when I play him. But, I beat him at gin all the time, and we’re about 50-50 with Yahtzee, so it all evens out (even though it wounds my English teacher’s heart that I don’t do better at Scrabble). These look like fun and easy things to take along, and I love that you have such history with each game. Our library dropped everything BUT Overdrive, so Kindle is pretty much it although I think you can download to a tablet as well. We plan to continue to primarily download from the library while we travel, but my big gripe is that you can’t renew, so when I’m reading something like Hamilton that takes longer than three weeks, when I can’t finish in time I end up ordering and paying for it anyway, which I could have done earlier rather than waiting months for the book to come off of hold!